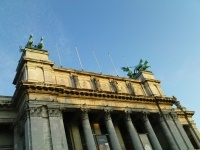 Royal Museum of Fine Arts Antwerp. The museum is closed for renovation until the end of 2018. This is a list of authors whose works enters the public domain in countries in countries with life + 70 years. With the exception of Belarus, a work enters the public domain in Europe 70 years after the creator's death, if it was published during the creator's lifetime. The list is sorted alphabetically and includes a notable work of the creator that will enter the public domain on January 1, 2018. Hans Fallada Template:Flag Template:Dts Template:Dts Writer Der junge Goedeschal, Little Man, What Now? In most countries of Africa and Asia, as well as Belarus, Bolivia, Canada, New Zealand and Uruguay; a work enters the public domain 50 years after the creator's death. Unless indicated otherwise, the text in this article is either based on Wikipedia article "2018 in public domain" or another language Wikipedia page thereof used under the terms of the GNU Free Documentation License; or on original research by Jahsonic and friends. See Art and Popular Culture's copyright notice. This page was last modified 16:41, 20 December 2017.